I have a 9.5 yr old Boxer named Rebel, colored tan and white. My dog weighs 50 pounds down from 55 pounds,the weight prior to the illness. The illness is very similar to the Black Crusty Skin Dog disease described. It started as 15cm x 20cm crusty, under skin area between shoulder blades in Nov. 2009. After that, my dog started losing hair. There is some sort of lesion on the lower lip that won't heal. It doesn't bleed and seems to be from tooth irritation. The dog breath has become VERY bad in the fall of 2009,(could smell from 8' away). The breath got better when fed from elevated bowl, or this could be a coincidence. The bone on top of the head has also become became very prominent vertically. Could this be because of the weight loss? All of these dog health problems do not seem to bother Rebel. The vet said that food is not a problem, and to continue to feed him whatever food he likes. His exam was very dismissive and cursory (based on 3 other subsequent DVM exams observed) with no comment on the dog crusty skin area. In January 2010, canine hypothyroid disease was diagnosed, with other lab test results basically normal. He took a Thyroid supplement 8 mg/diem RX Jan - April 10. He also takes an antibiotic (2 different ones). Jan through now he takes present 1000 and 1500mg. The thyroid RX was stopped by the current DVM-(Russell Vet Hospital). The dog hair continued to fall out, and is not regrowing much yet. I have seen four vets so far and none had seen the problem which by Feb 2010has spread, become very inflamed and granular. In April, the dog skin crust broke through the skin and looks like black nodules. These nodules continue to erupt in various areas in both small and large dog skin nodules. In May, the nodules erupted on the upper,inner sides of both legs. The skin was very dark and hyper pigmented. The back, neck areas also became hyper pigmented. Inflamed nodules on the chest were inflamed and pink, with occasional bleeding. The veterinarian prescribed Predisone injections in early May. This was of no apparent help with the condition worsening. Please help as I don't no what to do. Should my dog continue with the canine thyroid medications? Antibiotics? Other medications? At the end of May, we started my dog on 600 mgVit. Vitamin E, 3 IU Melatonin; 2x per diem each. Pictures below at Flikr website. Thank you for your question and sorry to hear about the canine hypothyroidism symptoms. Canine Hypothyroidism is related to the reduced secretions of thyroid hormones. An endocrinal (hormonal) disorder is related to the thyroid gland and the pituitary (master) gland. With respect to all the details you provided, all of your dog's problems, i.e. weight loss, dog skin problems and the way the problems have progressed indicate that all of the problems are related to the dog hypothyroidism condition. Hypothyroidism in dogs is more common in 4 – 10 years old dogs, and many breeds including boxers are comparatively more prone to this condition. This is a progressive condition, which becomes worse with age. this disease making it increasingly hard to manage. 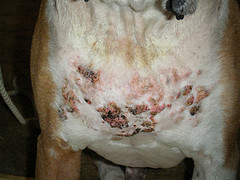 Additionally, symptoms such as weight loss, loss of dog skin condition which usually starts with alopecia (hair loss), skin lesions spreading from the dorsal to ventral surface and in the inner thighs and hyper pigmentation along with nodular lesions represents different degrees of canine hypothyroidism. Remember, all the symptoms you described is the stepwise pathogenesis or development of the hypothyroid disease in dogs. Unfortunately, your dog represents a relatively worsened case of the disease. As you described, that your dog was diagnosed for hypothyroidism and all other tests appeared normal. Even so, it is always necessary to probe the exact cause/reason the canine hypothyroidism condition started by further probing of the secretory rate (rate at which hormones are released), status of the thyroid and pituitary gland. Also regular monitoring is necessary for successful management of the condition. As far as a specific diagnosis and treatment is concerned, we recommend you take your dog for a detailed thyroid examination both clinically and in the laboratory. Your vet should not only test for thyroid status (T3, T4, TSH), but also go for some additional tests confirming the exact cause of it; how is it related to glandular activity, atrophy and any malfunctioning. Specific treatment is always based upon a confirmatory diagnosis. Most dogs that require canine hypothyroidism treatment require the administration of Thyroxine (T4) hormone for the rest of their life, according to the level of secretion (monitored through lab. tests) and clinical improvement seen. The most important factor in deciding the effectiveness of thyroxine therapy is improvement in the clinical status of disease. However, in older dogs like yours, it is important that you should get thyroid function and secretions checked every 1 – 2 months or as recommended by your veterinarian. Remember, confirmation of the condition and regular monitoring of hypothyroidism is part of the treatment plan. Thyroxine (T4) is only way to manage the condition in order to maintain thyroid secretions at normal levels. Monitoring through an assessment of any improvement in clinical status and in the laboratory are indicators for the effectiveness of the therapy. 1. The dose or frequency of administration of thyroxine (T4) is improper. 2. Thyroxine is either not properly administered or the patient is unable to absorb/metabolize it properly and is excreting it rapidly. 3. The Confirmatory diagnosis is not correct or the condition needs to be retested. While your dog is being treated specifically with thyroxine, we can recommend some additional supportive remedies that can help your dog feel better, in addition to the specific treatment recommended by your veterinarian. Specifically, natural remedies can help to maintain normal thyroid function such as Thyro-Pet, while at the same time help to improve your dog's metabolism, digestion and immunity with a natural remedy such as Energy Tonic. Also, be sure to use a quality medicated shampoo such as NutriVet for bathing your dog and administer some type of skin and coat tonic such as Skin and Coat Tonic to improve skin health and support the regrowth of lost dog hair. Best of luck to you and your dog. We hope these suggestions help improve your dogs condition and the severity of symptoms associated with hypothyroidism in dogs. Weight loss is usually associated with hyper not hypothyroidism - typically hypothyroid dogs gain weight without explanation and lose some once medication commences. Has your dog been tested for Cushings disease as the symptoms are similar to hypothyroidism. My dog was showing signs of Hyperthyroidism, he was losing weight, always hungry, panting, rapid heart rate. The vet didn't Know what was wrong after a blood test looked normal, so I had to figure it out myself. I saw an article about how coconut oil regulates the thyroid, so I started him on it and slowly got him up to 1 tsp per 10 lbs. of body weight. His symptoms immediately went away and he started gaining his weight back, however he broke out in a scabby rash and then his hair thinned out a lot. Now his thyroid is regulating and he is growing his hair back. I just went through an ordeal with my english bulldog. He had lesions that were similar looking to the lesions on your boxer. At first the vet assumed it was a bacterial or fungal infection. After treatment with multiple antibiotics and cipro we decided to biopsy the lesions as they were worsening. The result of the biopsy was calcinosis cutis. (calcium granules that form within the skin) there are many causes of it with the biggest one being Cushing's Disease (or overproduction of cortisol within the dogs body) In our case because of the allergies our dog has had he was being treated with prednisone (doses that ended up being too high) and it caused the Cushings. It is too long to explain on here but know that if your dog is cushinoid it could cause hypothyroidism too. Cushing's can also cause hairloss, skull like appearance to the head, etc. It is a simple blood test to determine if a dog has either medically induced Cushings such as our dog did or the natural form. You might look up the disease and symptoms to see if your dog displayed any of them prior to the treatments you've tried. Good luck. Join in and write your own page! It's easy to do. How? Simply click here to return to Hypothyroidism.